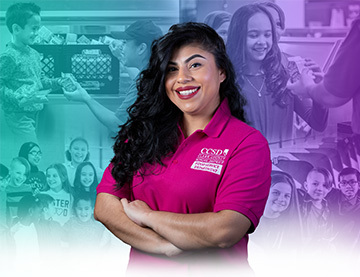 CCSD has opened many doors in my city and community. I being, an Accountant, tried school bus driving, loved it, and resigned as an Accountant. Been with CCSD for 3 years. The district has been supporting me to keep growing on my career, like now I am a temp school bus driver and a job fair assistant. I was born in Mexico. I have lived in Vegas for 15 years and in the U.S. for more than half my life. Skilled Trades Assistant with the HVAC Dept. I love CCSD because it is a professional friendly environment. Working for the maintenance department with CCSD involves a lot of hard work, but it also has a few fun factors. I travel from school to school and site to site. I see lots of different faces and meet lots of different people every day. Also the scenery is different when you see it from the roofs of different buildings. My job is a different adventures every day. We service hundreds of HVAC units in various schools and professional buildings throughout the entire Las Vegas area. It is a rewarding job. Las Vegas’ weather is one of extreme temperatures. Most times, it is either too hot or too cold. My job is to keep our students, teachers, support staff and paraprofessionals in a comfortable temperature setting inside our CCSD buildings. 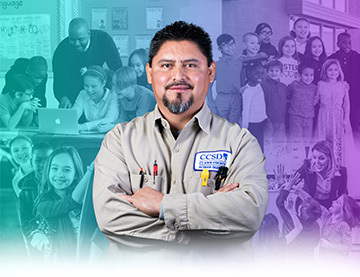 It is a rewarding feeling to know that by maintaining our A/C systems I help students and CCSD personnel accomplish their duties inside our school and buildings. CCSD supports my growth by allowing me to put the skills I learned in school into practice in real life situations. Being a skilled trades assistant allows me to learn while working geared towards my goal to become an HVAC Technician. CCSD hired me right after graduating from trade school and that helps me grow as a person with my family and as a professional with CCSD. I was born in South Central Los Angeles. I lived in Bell Gardens California. My family and I moved to Las Vegas in 1993. I love CCSD for many reasons. I feel like my job is very rewarding. Feeding the kids and sending them off with a full stomach is a good feeling. Another thing I love is having the same schedule as my own kids that attend CCSD. I get to spend all my free time with them. I am obsessed with the Care Bears (80’s baby). Although it can be a little stressful, it’s also exciting. But the best word to describe my job would be fulfilling. When a student says to me “thank you for the lunch, it was delicious” it truly warms my heart. CCSD has always supported my growth. I started as a temp worker, but with an awesome supervisor and Regional Supe that saw potential in me. I quickly moved up and run my beautiful kitchen at Dr. Beverly Mathis E.S.